Bilikiss Adebiyi-Abiola and her cofounders started WeCyclers in 2012, using low cost cargo bicycles called WeCycles to provide convenient recycling services to households across Nigeria. Although born and raised in Lagos, Bilikiss initially developed the idea for her business in the US whilst she was a student at the MIT Sloan School of Management. This followed a five-year career as a corporate software engineer at IBM where she gained invaluable business and technology experience. Whilst at MIT, she was assigned to a study project aimed at finding solutions to tangibly help people at the bottom of the social pyramid. In Nigeria, about 70 per cent of Nigerians are at the base of the pyramid and are very poor; they don’t have basic sanitation; they don’t have basic healthcare, and she wanted to do something that would impact that segment. She was also very interested in waste because as a Nigerian, waste is something she saw everywhere and she wanted to solve that problem, Going back to her country roots in Nigeria, Bilikiss was inspired to work on finding a much-needed and effective new solution to the problem of waste management. 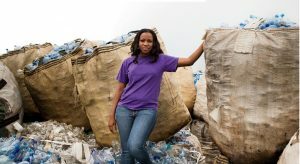 Her project, which eventually became the inspiration for her company WeCyclers, was a practical response to dealing with huge local waste issues in Lagos, where only 40 percent of the city’s garbage is collected.